(Nanowerk News) Researchers at the University of California, San Diego Jacobs School of Engineering have developed a technique that enables metallic nanocrystals to self-assemble into larger, complex materials for next-generation antennas and lenses. The metal nanocrystals are cube-shaped and, like bricks or Tetris blocks, spontaneously organize themselves into larger-scale structures with precise orientations relative to one another. Their findings were published online June 10 in the journal Nature Nanotechnology ("Self-orienting nanocubes for the assembly of plasmonic nanojunctions"). 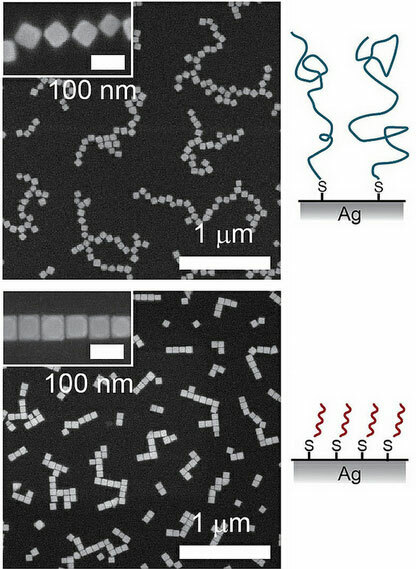 UC San Diego nanoengineers have developed a technique that enables silver nanocubes to self-assemble into larger-scale structures for use in new optical chemical and biological sensors, and optical circuitry.